Okay, first off y'all....I had really, really bad blogging luck last week. While I did visit all the blogs who linked up, I couldn't seem to actually comment on any of them. I'm guess the problem was on my side, because it didn't seem to matter if it was a blogger or a wordpress blog. I have no clue what the issue was, but I've been able to comment for the past few days, so hopefully that has passed. And then I had it with Bloglovin...it wouldn't actually show any blogs! Ugh! I switched over to G2Reader which, I do like better than Bloglovin but, well, let's just say there is still room for improvement. Oh, Google Reader, how I miss you! 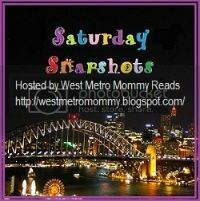 Alrighty then, onto this week's Saturday Snapshot. This has been a slow week for us, which is fine because our next 2 weeks are crazy, then we have a week "off" (although it is the week of the 4th and, since we are leaving the next week, I am now hoping we stay home!) and then off on our road trip. Next week, my daughter is in Zoo Camp all next week, so I have some little adventures planned for my son. Yes, pictures will follow! As for this week, here are some pics from a recent library visit. During the school year, I usually only go with my son as my daughter is in school. During the summer, however, my daughter gets to join in the fun. I coordinate our visits with story time so that there is something for the kids to look forward to. First it's story time...which is always busy. This week's topic was frogs, which was a hit with both of my kids. Afterwards, the kids get some play time. Our library is stack with educational toys and these magnetic "blocks" are a hit with the kids. Then, I get a very, very short chance to hunt for new books for the kids before they are DONE. And then we do it all again the next week!